The resting ground of some eminent Victorians, the Brighton Cemetery is a majestic and significant place to visit. 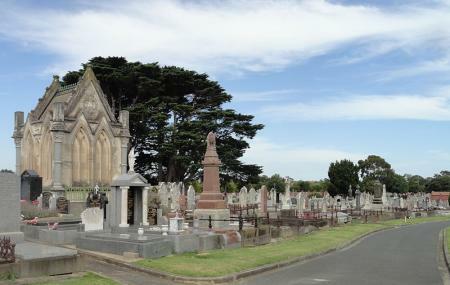 It is one of the oldest cemeteries in Melbourne offering a varied range of burial, cremation, crypt and mausoleums to pay tribute to those who are no longer with you. Spanning 30 acres of land in a serene atmosphere, the Brighton Cemetery features a number of intricately crafted monuments and the Victorian classic garden. The cemetery also contains 125 War Graves dedicated to the fallen soldiers of World War I and World War II. The Cafe Vita et Flores offers freshly cut flowers and coffee for the visitors. Great staff and full of history but such a shame that people living in Sheffield Street and Sussex Road, that border the cemetery, cannot be buried there. Perfect service from the cemetery staff when looking for a pioneers grave site. I cannot speak highly enough of them. But... BEWARE of the website run by Travis Sellers trying to get you donate for information I got freely from the genuine cemetery staff. He told me they would not be able to supply the information that he could, but that was false. He also said he would send the info to me only once he received a donation. His website stresses $20 is the average donation. The early pioneer I was seeking would be disgusted to know Travis was using him to trick people into making unnecessary donations to him. The residents are so quiet and keep to themselves.